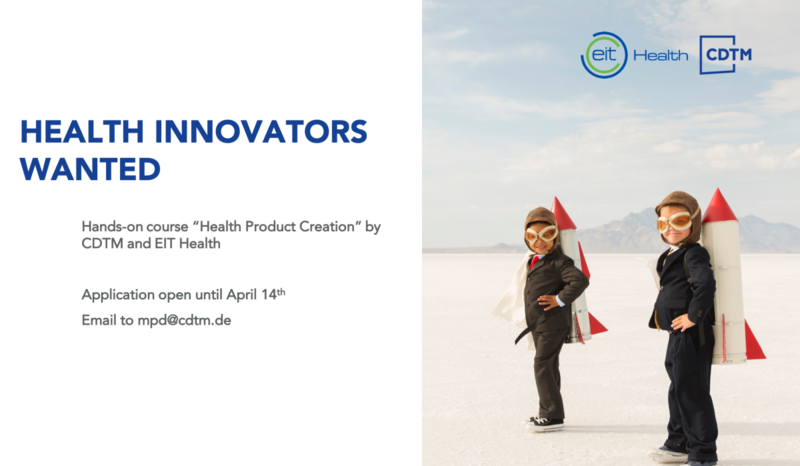 The Center for Digital Technology and Management (CDTM) together with EIT Health (European Institute for Innovation and Technology) is offering you the chance to apply for the hands-on course “Health Product Creation“. Throughout twelve weeks, you will work in an interdisciplinary and international team of 4-5 exceptional students to develop a new product and business case for the health sector. Starting from a challenge statement by your industry project partner, you apply design thinking methods to develop a user-centric product. This includes business modeling, hands-on prototype development, user research and iterative user testing. The process is accompanied by high profile lectures by leading experts and course instructors. The final product and working prototype will be presented at the Design Fair demo day in front of 250 people. As part of the EIT Health Network, you will receive an official course completion certificate (equivalent to 9 ECTS). The course requires on average two days of workload a week, the input lectures will be given on Wednesday evenings, from 5-9pm, at the CDTM. Please be aware that some course appointments might be in the late evening. The project kick-off will be on April 24th from 5-9pm, at the CDTM. We especially encourage international students from all backgrounds who currently stay in Munich for an exchange semester/year to apply for the course. The goal is to have a multi-national and pan-European perspective on health innovation. Applications are open now until 14th April 2019 11.59pm. Please send the following documents to mpd@cdtm.de, addressed to Mr Michael Fröhlich. IMPORTANT: All application parts above are mandatory for a successful application. Please only apply, if you can guarantee your availability and active involvement throughout the entire project. If you figure serious time conflicts with the schedule, please let us know in advance. Please also be aware that this application is for the “Health Product Creation“ course only, not for the study program “Technology Management” of the CDTM. You will be informed about your admittance to the course within 3 days after application deadline, by 17th April 2019 11.59 pm latest. In case of further questions, don’t hesitate to contact us at mpd@cdtm.de. We are looking forward to your applications!